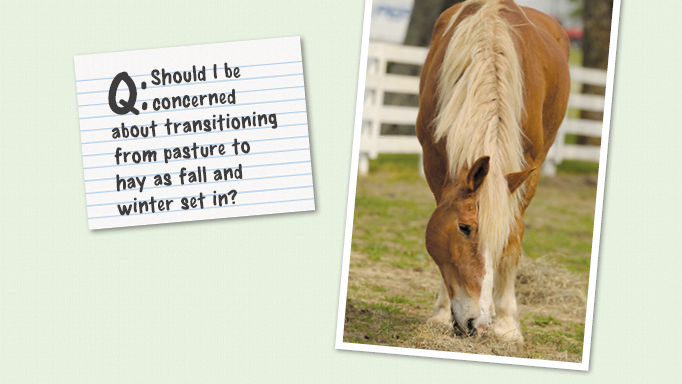 Written by: Shannon Pratt-Phillips, Ph.D.
Get advice on how to transition your horse from pasture to an all-hay diet over the winter. Transitioning to any new feed requires patience. 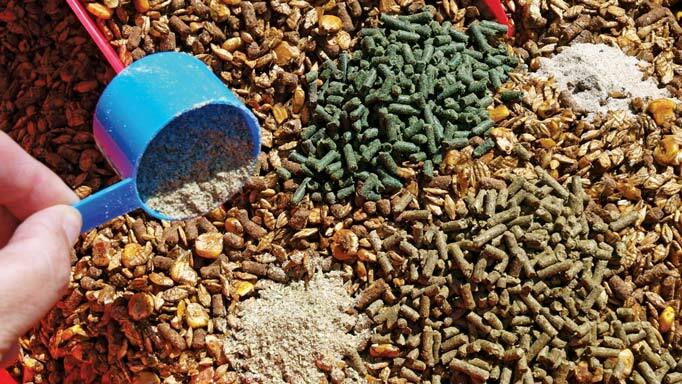 Several research studies have indicated that the risk of colic increases with any changes in feed, and, in particular, changes to new forages. The horse’s hindgut (cecum and colon) is filled with millions of microbial organisms that work specifically to break down fibrous components of feeds. Forages – hay or pasture – are high in fibre, and there may be differences in the types and fractions of fibre (cellulose, hemicellulose, for example). Slow transitions between different forages gives the microbial population time to adapt and adjust to the different fibre components that it can ferment. 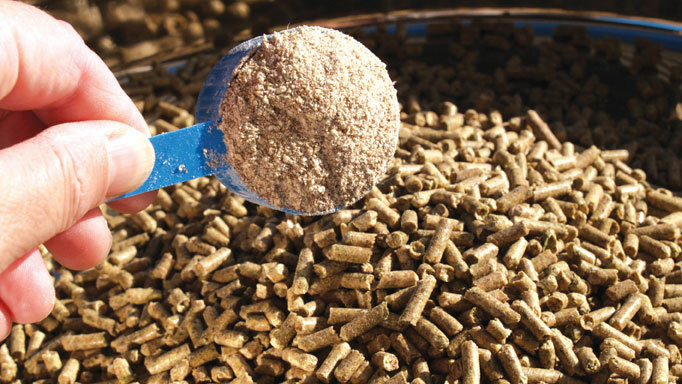 The general recommendation for any feed change is two weeks of gradual adjustment, typically by increasing the new feed by 25 per cent, and decreasing the old feed by 25 per cent every few (~4) days. With pasture, the transition could be achieved by introducing some hay into the field. As the weather cools, the pasture plants will go dormant, and there will be less available to eat, meanwhile the horse will have access to the hay instead. This provides a slow and natural adjustment from fresh to dried forages, while also allowing the horse to continue to be housed in his normal environment. As full winter sets in, your horse should already be eating hay so the lack of pasture grass will be less of a change to his system. If he is taken off grass earlier and moved to a different turnout area, you may consider allowing him out on his old grass for a few hours per day, and then returning him to his new hay-only turnout area. This would give the opportunity for him to continue to consume some grass while also transitioning to the new hay. Learn how to use yeast cultures, probiotics and prebiotics to improve digestibility. 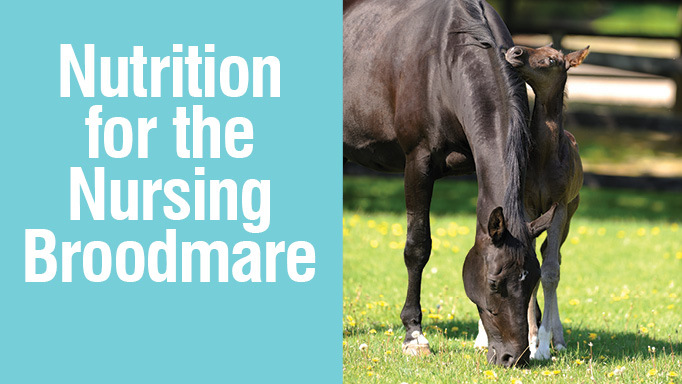 Learn how to ensure your broodmare and foal receive adequate nutrition. 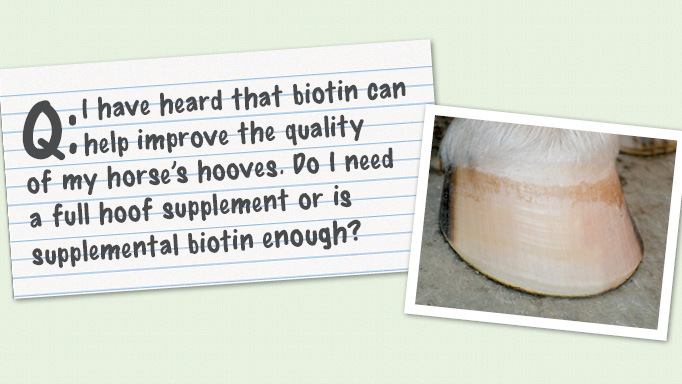 Find out if find out if feeding supplemental biotin can improve the health of your horse’s hooves.